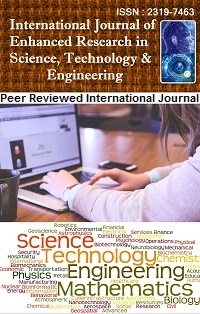 IJERSTE (IMPACT FACTOR: 4.059) is an international academic journal which invites unpublished novel, original, empirical and high quality research work pertaining to recent developments & practices in the areas of Computer Science & Engineering, Information Technology, Electronics & Communication, Electrical & Electronics, Electronics and Telecommunication, Mechanical Engineering ,Textile Engineering, Chemical Engineering, Biotechnology, Instrumentation, Automation, Sensors, Control System, Robotics, Artificial Intelligence, Civil Engineering, Modeling and Simulation, VLSI, DSP, Image processing, Neural Network and Fuzzy Logic, Biology, Physics, Chemistry, Mathematics, Bio-Chemistry, Food Technology, Algorithms, and emerging paradigms in allied subjects. The above mentioned tracks are only indicative and not exhaustive. IJERSTE journal is indexed in Thomson Reuters Researcherid, Endnotes, Google Scholar, Europeana Libraries and many more national & International libraries.